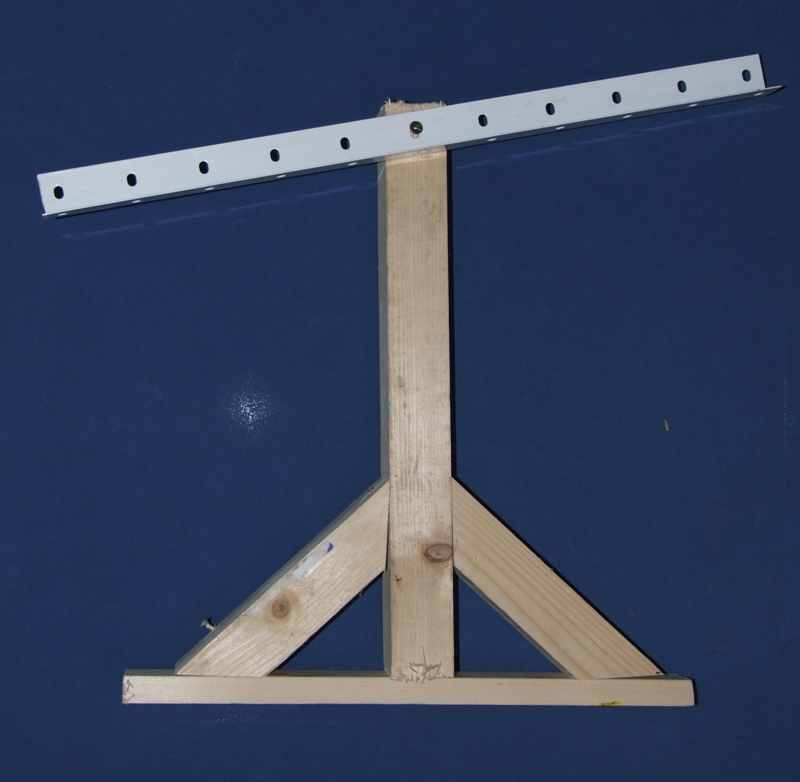 Here are instructions on how to build your own playfield rotisserie or playfield tipper as this device is also sometimes called. In the past when I shopped a pinball machine I usually left the playfield inside the cabinet. But as I started to shop more pins, usually it's easier to take the playfield out. I recently restored an Indiana Jones pinball machine and had the playfield on a table. When I wanted to work on the underside of the playfield I had to be very careful and it took some effort to rotate it. As I often shop a pinball playfield, I knew I had to make it more easy for me. A playfield tipper was the solution for me. 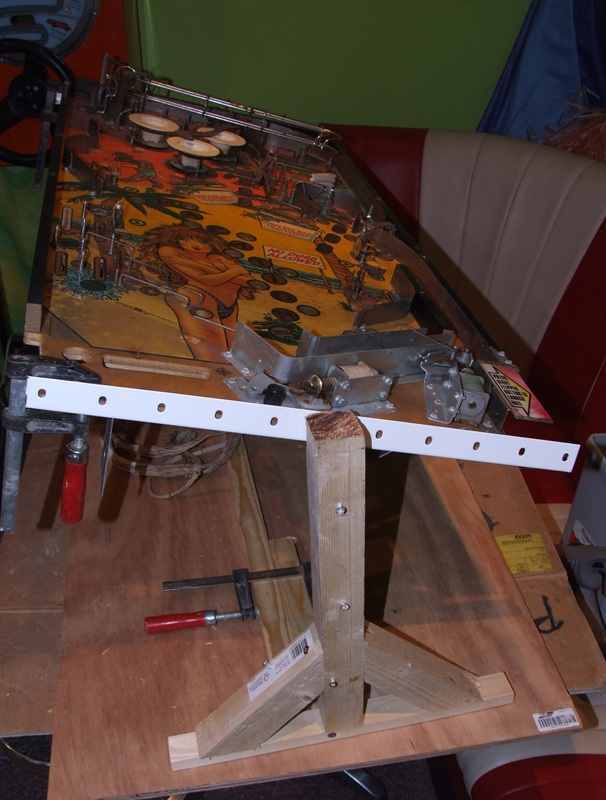 A friend of mine (Michel) had made one a few year ago, some details of his playfield rotisserie are on Ed Cheungs website. I could borrow it but he said it didn't fit in his car, I had to come and pick it up myself. What ? 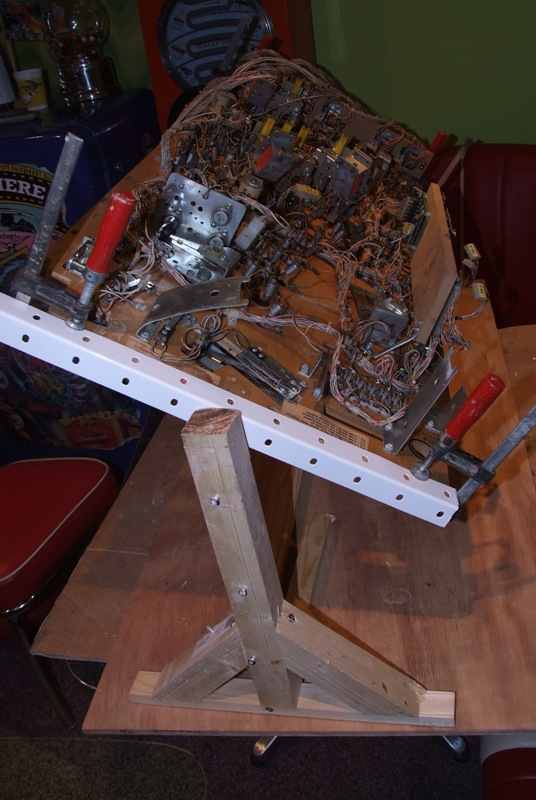 It was very big, it's not only the size of a playfield but the rotating parts add several inches on each side of the playfield, and he had mounted everything on a very large piece of wood.. Nevermind then, if it doesn't fit his car it's certainly not going to fit inside my gameroom where empty room is a premium.. So my solution was to build it myself. You can buy rotisseries but they're not cheap.. there are plans online of people that have made it themselves, some use wood, most use metal (but you need to weld), and some even use plastic pipes. As I still want to earn a cargpb status I wanted to make it as cheap as possible, with some junk I had laying around the house (don't have time to go shopping for parts) and also make the parts small.. when it's not in use I should be able to put it away. I didn't want to use a special rotating assembly, used a regular screw to hold it into a wood base I made. 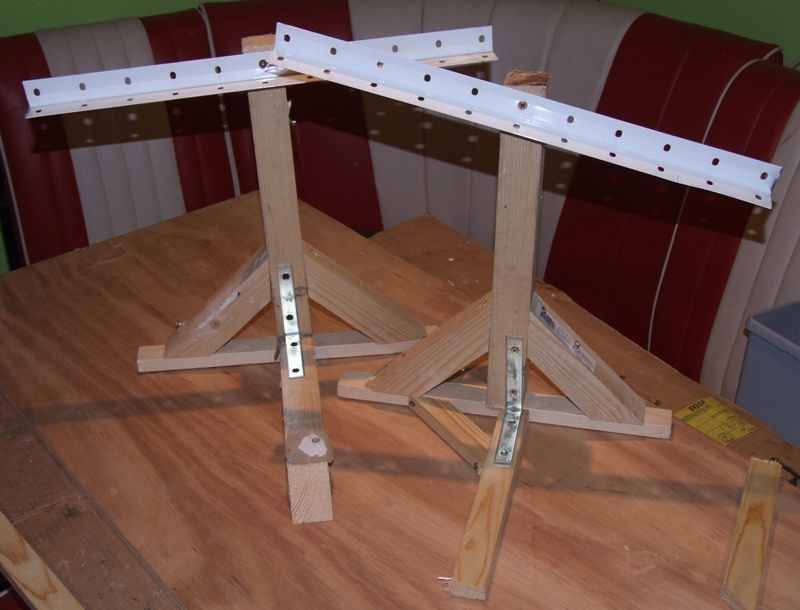 I tested this and it is not stable.. Make sure the base is tall enough so you have room enough even for wide-body playfields to rotate. So the next step was to use some more scrap wood I had laying around and extend the base so it would become more stable. I didn't have a lot of wood left so they're not identical. Ideally you make both parts of the same thick wood. This was better, and to give the whole rotisserie really enough stability, I use a piece of wood that I clamp between the two outer parts. That way they're connected and the whole part becomes very stable. I can move the middle piece of wood depending on the length of the playfield I want to fit in the rotisserie. It also allows me disassemble the parts again for storage. The large piece of wood underneath everything is just for support as the table everything is sitting on is just not large enough.. There are no parts of the playfield tipper screwed into it. Here's a playfield mounted onto the playfield rotisserie.. I did note I need a bit more clearance on the end, the screw that holds the metal L-frame should extend at least half an inch..